From Final Fantasy to Phantasy Star to even Super Mario, the role-playing genre — specifically, the Japanese one — is massive and developers are constantly searching for the next big thing to bring to JRPGs. Legrand Legacy developer SEMISOFT is no exception as it attempts to marry some new aesthetics and ideas with the nostalgia of past classics, but is unfortunately hampered by somewhat poor execution. Right off the heels, Legrand Legacy has a very unique aesthetic. SEMISOFT uses panels of 2D artscapes for its environments, which are breathtaking. The amount of detail in each frame is remarkable and it serves to draw the player into the huge fantasy world that just envelopes the characters. However, the 3D models used for the game look like they’re ten years old, and it’s quite jarring to see the 3D character models on a 2D plane. Moving around the world is arduous and clunky; it’s difficult to tell where walls actually exist on the 3D plane because the whole environment is 2D, causing characters to accidentally wander into traps or enemies far too often. Although this design choice benefits the game massively from an aesthetic standpoint, it’s not worth the trade-off from a mechanical standpoint. The game really displays the talent of the artists behind it through its musical score, rendered cutscenes, and character dialogue panels. The music varies from place to place, adding a charming ambience to each destination. The rare but treating cutscenes are quite beautiful for the most part, although the overall quality is let down by a couple of washed out, robotic scenes in the mix. A very interesting detail in Legrand Legacy is its animated character dialogue panels, showing the characters’ facial features as the player reads the text. It adds a very nice human emotion and relation to the dialogue. SEMISOFT has applied a number of different ideas to Legrand Legacy’s combat system, which thankfully takes place on an entirely 3D plane. At first glance, the game’s combat appears to be quite typical of your classic JRPG, and it is, but there are a few key areas in which SEMISOFT has aimed to improve upon the standard formula with varying degrees of success. Player characters are placed in one of two rows: those in the front row use melee attacks, characters in the back either heal, buff, or use ranged attacks. This creates a very interesting dynamic when it comes to turn-based combat: the player can have characters in the back recharging the front-line characters’ ability meters while the front-line characters defend against the enemies’ attacks, therefore suffering minimal damage and being able to unleash their more powerful abilities more often. This tactic itself seems to break the game quite a bit when facing more powerful enemies, and can be used to win almost any battle the game throws at you. Enemy types and variants are very, very refined and intriguing in Legrand Legacy, to the point where I found myself very excited to explore new areas just to see what freaky, odd creatures the game would throw at me. As intriguing and variable as it is, and considering just how important it is to the game, it’s sad to note that the game’s combat is marred by a number of poor decisions on SEMISOFT’s part. Legrand Legacy employs a Quick-Time Event (QTE) for every attack the player triggers — kind of like in a Super Mario RPG. But in any Super Mario RPG, those QTEs are fun and quirky and fair; in Legrand Legacy, a lot of the QTEs lag and they are as simple as a button press. This ruins combat so effectively that I found myself quitting the game after half an hour due to sheer frustration. It removes most strategy as, even if the QTE is triggered perfectly, it may still fail for seemingly no reason. The combat is extremely simplistic with spots of frustration. For the most part, the best tactic is to pick off an enemy at a time and not stuff up a QTE, which can leave the player feeling unsatisfied and severely underwhelmed. Like most of its JRPG contemporaries, Legrand Legacy is an extremely story-driven game, following a gladiator-peasant named Finn as he embarks on a quest with a band of estranged and bizarre heroes to save their homeland of Legrand from civil war and otherworldly invasion. Although the set pieces really frame an epic fantasy, the story itself comes across as clichéd and at times, poorly written. Dialogue is a type of bad that is quite uncommon. Characters discuss exposition very openly and horribly, but they do so without context; they simply rattle off names and events as though the idea was to omit key plot details in order to create more intrigue. Instead, the player is often left confused about what’s going on and what’s being discussed, replacing any immersion with frustration. Unfortunately, the story is also quite disjointed, with characters acting inconsequentially and without any real thought and events feeling as though they’ve occurred out of coincidence rather than as the result of an action. For example, early in the game, Finn is tasked with finding a girl in a town named Shapur. To get to the town of Shapur, he seeks the help of a noblewoman/adventurer/badass, Aria. Rather than simply guiding Finn to Shapur, Aria decides to take him on an unrelated quest to find a man named Lazarus, who tells her that the world is facing a cataclysm and she’s one of the few people who can save it. He tells her that she has to find the saviours of the world or else everything will end. He describes to her impossible events and tells her that her companions will aid her in saving the entire world. After witnessing all of this and being asked to join Aria in her quest to literally save the world, Finn decides to continue on to Shapur. To recap: the player is taken on a completely unrelated quest, told of a major, world-defining event, and asked to help save the world, but the game decides that they should continue searching for some girl they have no attachment to. The characters in Legrand Legacy come off as dull husks that have no human factors to them, they merely exist to push forward a narrative that the player has little familiarity with. Legrand Legacy is rampant with odd design choices. For instance, in combat, if two characters attack the same enemy and it dies to the first strike, the second one will simply attack the dead enemy rather than choosing a new target as in many other titles. Contextual cues surrounding combat scenarios have no given context; the word “INTERRUPTED” means nothing if the player isn’t told whose attack was interrupted. Then there’s the level-up screen that doesn’t detail any stat changes or new abilities learned, forcing players to enter a totally different screen to research and make those changes for themselves. The game fails to mention that, though, so when the player discovers they’ve poured 15 points into an attribute that says it upgrades evasion, but only by 0.2% each time, it brings with it an overwhelming frustration. The overworld map is gorgeous to look at, but very odd to navigate; it marks some locations, but very few, meaning that the player is forced to remember where everything is (no small feat in a large world such as this one). There are many small problems that worsen the experience of Legrand Legacy, which is a terrible shame because it has great potential. A lot of talent and love went into it, and it shows; it just suffers so terribly from bad mechanics. 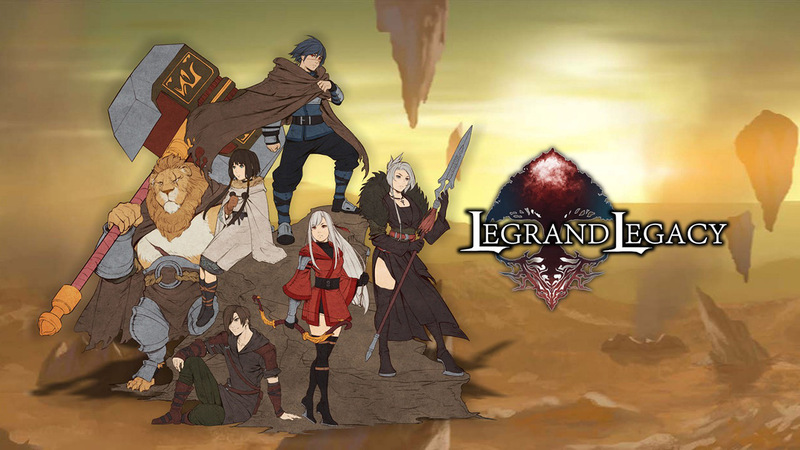 Legrand Legacy aims to pay homage to JRPGs long past, but with its own creative spin on things. Unfortunately, it feels outdated rather than new and refined, and only made me want to play the JRPGs it pays homage to. The mechanics are frustrating, the narrative is well-written at times but ultimately underwhelming, the driving characters are clichéd and seemingly stupid, events occur out of chance and progression is hindered by a lack of scope. Legrand Legacy is very beautiful in its aesthetic, but unfortunately, its execution is poor and troublesome.